Something really nice popped through my letterbox this week. It wasn't a bill, nor a scary brown envelope from the tax office, thankfully it was the Blu-ray version of Hammer Film's 'The Hound of the Baskervilles'. Released as a dual DVD / Blu-ray combo by Shock Entertainment, the DVD is coded to Region 4 and the Blu-ray to Region B. I can't play the DVD version to compare the quality (as I can only play R2 discs) but the Blu-ray version looks amazing. I'm used to poor prints with washed out colours when it comes to watching Hammer films (admittedly this is my first Hammer Blu-ray), so it was a real surprise to see how good it looked. In fact, the film transfer was so good I could barely believe that the film I was watching was over fifty years old. The only downside on the release is the lack of extras. There is a nice featurette on Hammer stalwart (and Dr. Watson in the film), Andre Morell, but a 'making of' or a commentary wouldn't have gone amiss. Now, I can't see any point in writing a review of the film, as we've all seen it by now (and if you haven't, you need to rectify this at once). 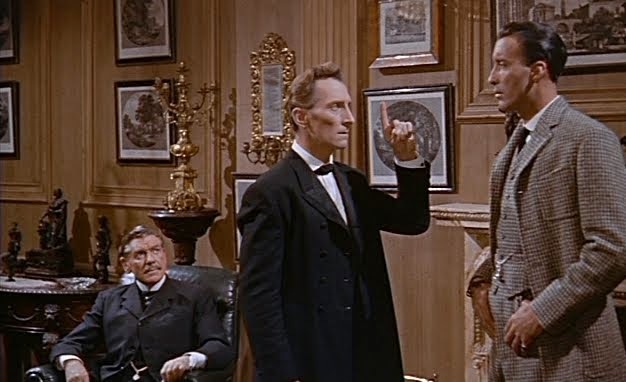 I for one love the Hammer version, and rate it as the best adaptation of ACD's most famous story (as much as I love Jeremy Brett's Holmes, I have to admit that his Hound falls short when compared to Cushing's 1959 effort). Cushing, Morell and Lee in fine form and in high definition - what more can you ask for?